Once you've worked with a chef's knife, you'll become attached to it rather quickly. A knife is of the most used tools in any kitchen. 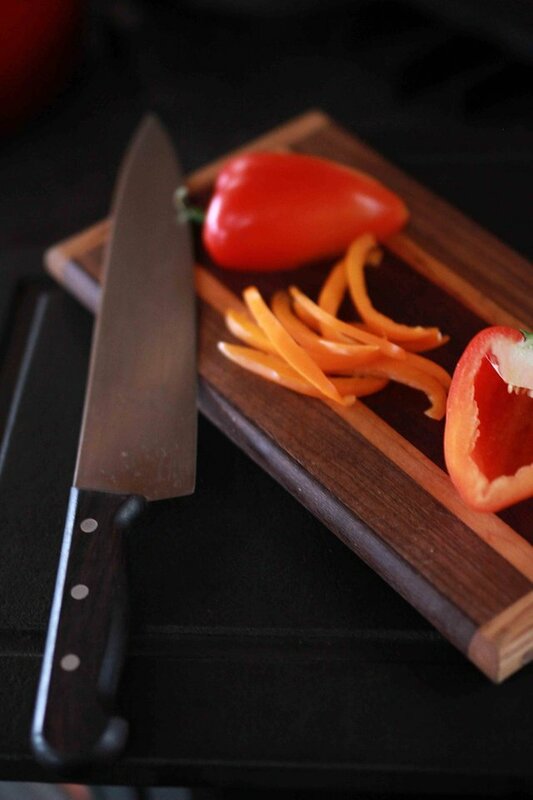 A well sharpened chef’s knife is a heck of a work horse. Whether it’s chopping through a chicken or carefully mincing garlic, a good quality chef’s knife should be at the top of any homesteader kitchen list. A knife with a good heavy blade and durable edge is best. You want something that will withstand hard, daily use. When selecting a chef's knife you'll want to look at the different size options. If you can, visit a kitchen supply store so that you can handle the knives. The 8" blade is most common in home kitchens. Personally, I prefer to use a 10" chef knife. Such a big knife can seem a little intimidating at first but a few days you'll probably be wondering how you ever managed without it. I've got a good number of knives and most sit unused in a drawer. The knife that I use every single day, and couldn't manage without is the Victorinox 10 Inch Rosewood Chef's Knife. It also comes in 8" and 12" (the 12" being recommended for people with large hands). I like the weight, the balance and the comfortable wooden handle. Victorinox has been making kitchen knives since 1884 and the lower price point is a pleasant bonus. Soups, stews, stocks, sauteeing, baking, etc. We use a cast iron dutch oven for almost everything, and, if push came to shove, we’d probably keep it over even our cast iron pan. I've got a few different brands of Dutch ovens and I really do suggest saving up and buying a Le Creuset. If you want a pot that's durable, and going to stand up to many years of use, they've mastered it. I have a Henkel dutch oven and a ....and I am not happy with either. The enamel is chipping and wearing down and they are only a few years old whereas our Le Crueset pots are 7+ years old and have travelled across Canada twice. I've noticed that Le Crueset pots will go on sale now and again so keep your eyes peeled and you are sure to get a bargain. I actually bought ours using Aeroplan travel miles way back when we got them! For general cooking and baking needs. A large cast iron pan is a versatile, durable, reliable way to cook almost anything. It can go from the stove top (or fire) to the oven then right to the dinner table. On our homestead they are constantly in use. We've written about using cast iron quite a bit: Cooking With Cast Iron Made Easy! Tips For Perfect Cast Iron Cooking and Getting Started With Cast Iron Cookware are a few of our articles. We quite like the American made Lodge cast iron pans, they've been really reliable. I do favor my older vintage cast iron because it tends to be lighter and smoother but even so, you can't go wrong with a lodge pan. Over the past couple of years, we've started using the multi-purpose stainless steel steam canner from Victorio. The steam function saves a lot of time, which matters a lot when you are preserving food. I am extremely happy with this product and would never go back to water bath canning! I've written a detailed review on it that you can read here. There aren't a lot of pressure canner options out there. We use the Presto pressure canner. It is lightweight, aluminium and does a good job. The two other brands that make good pressure canners are Mirro and All American. There are those that love a coffee in the morning, and then there are those that simply can't function without their morning coffee routine. I fall into the latter category. I LOVE COFFEE! 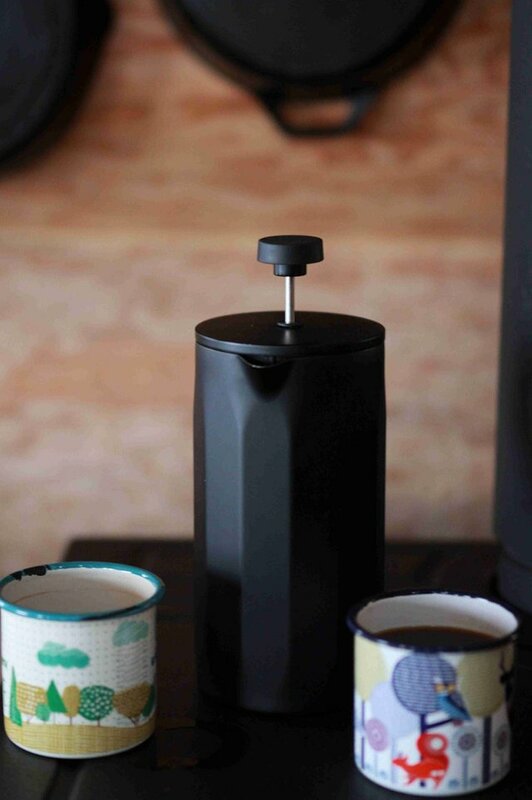 The coffee grinder ensures you can turn bean into ground, moments before you brew. We use an old fashioned, non electric, manual coffee grinder. It's really satisfying to grind those beans by hand, releasing that lovely fresh ground coffee aroma into the air but electric models work great too. The coffee press, or French press, delivers the ultimate coffee experience: no paper filter, no machinery, just excellent coffee that always has a “certain something” to it! This item probably shouldn’t be on the "homestead kitchen essentials" list, but sometimes, a person just has to take a stand. For making wine and beer from such things as carrot, parsnip, rhubarb, birch, raspberry, elderberry, honey, and more you’ll want some carboys in varying sizes. We use small 1 gallon carboys most often. When you are making wines and other wild crafted items the small size is far more practical than the large 5 gallon carboys. They make it easy to make up small batches. We've also got a wide mouth 1.5 gallon carboy that I LOVE because of how easy it is to clean. For sauerkraut, kim-chi, apple cider vinegar and other fermented products you will be well served to get yourself some fermenting crocks. I love the larger crocks for making things like sauerkraut and apple cider vinegar. I also use the Masontops Complete Mason Jar Fermentation Kit for smaller batches of ferments such as grape leaves, fiddleheads and beet kvass. Our fridge is always filled with mason jars of various foods we've fermented over the summer. I do so love cast iron but got rid of most of them due to our normal electric range which is a flat top and the glass seemed to mark easily... hoping I just put them in storage instead of thrifting them and that I will find them again... I did recently purchase a flat plate from The Lodge and love it for making my pizzas. I have told you this before but I love your stove. 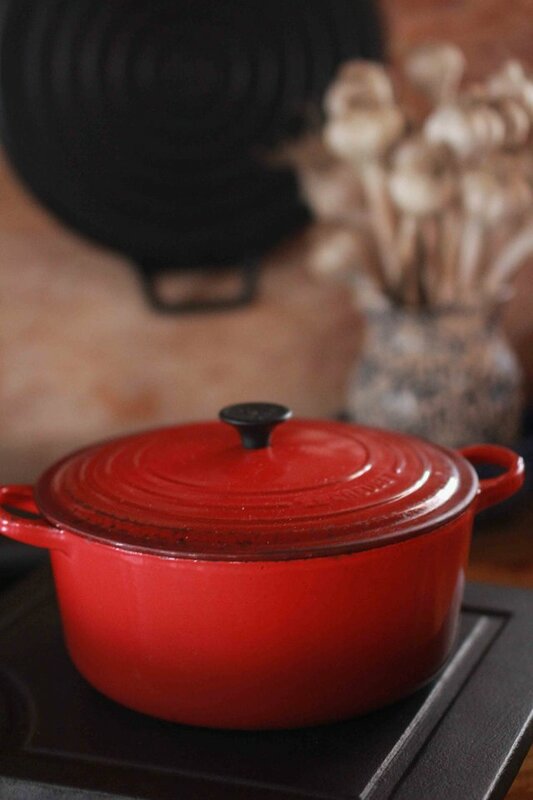 I have that red Dutch oven but ours is an Aldi version ... just as good in my book and cost me 20 bucks! We have all except the coffee press and the La Crueset. I am looking to by an All American pressure canner because they are stainless steel and don't need gaskets. If I ever get a wood cookstove I'd invest in the La Crueset. Every time I see your cast iron collection, I think, how lovely!! I've had my favorite chef's knife for nearly 45 years and it's quite worn down now. I'll look into your recommendation of the Victorinox Rosewood knives for my next one. I would love an All American!!! That's on my list too. I've not had to replace any of the gaskets on our presto model but the gauge has had to be replaced. I've learned that I should not store them in the cold garage in winter. That is surely a good knife if it's served you so well for 45 years - I love that. I wish things were made to last like that these days. I am always so careful to look for those things that will because it really is upsetting when money gets wasted! To keep the gasket from oxydizing, I sealed it in a vacuum sealer bag with oxygen packs... Did the same with the rubber rings for bale type canning jars. oh that's an interesting idea, thanks for sharing! Another awesome I depth blog post Charlotte! With all the homestead basics. I could click through the links learning homestead heart all the good things! I have never worked with carboys but will watch for them at the local thrift shop. Would be nice to have something yummy, bubbly that could even get a girl a little tispsy while reading through! Haha great blog! haha, it is nice having something bubbling away that you know the ingredients of! :) How's it going with your sourdough project? Yes! No kidding! The sourdough starter is still percolating. There were a few big bubbles last i looked. Which reminds me, better check it today!! Whoops.... Bubbles and mold it seems today! Better Luck Next Time! Now, I am on the hunt for some proper sourdough starter! I also dearly love my french press. You are right, there is just something about pressed coffee! The rest of stuff is on my 'to get someday' list.. I have never canned before. Im not allowed a pressure canner, (hubby is sure it will explode), but will water bath can someday. I ferment things, but am using glass jars for now. I cant imagine how nice it would be to have an actual crock and carboy, haha! I have converted five people so far that were terrified of pressure canning and now they think its the best thing ever! Perhaps I'll have to work on convincing you. Maybe one day I;ll figure out how to do a video. That exploding thing is the worst rumour/myth ever. haha. The crocks are really lovely but I do things in such big batches sometimes so that's the main benefit. I love the convenience of the glass jars! I like big batches too! I use a 2gal glass jar to make my kombucha in and love it! Ive always thought a crock would be fantastic, but they are pretty pricey. I love my chef knife and my Dutch oven. If you've never baked a bread in a Dutch oven, you must try it! It makes the inner part steamy and moist while the outer crust is crunchy and flky and shiny. The best method outside of perhaps a true clay or wood fired bread oven. I have one question, I have a pressure cooker that I use constantly. Is a pressure cooker suitable for canning? I can sterilize many things in it, so I considered trying jars for canning but I'm not sure it's appropriate. I would love any suggestions you have. I find pressure cookers great for such a wide range of things that I'm loathe to give mine away and would love to take it to the off grid Homestead with me when we move. (this is of course dependent on how energy hungry it is, as we will be relying primarily on solar). Also I loooove your stove! The cook top with the swing out surfaces is amazing. I'd love to know where you got it, as we will soon be looking for one! Unfortunately a pressure cooker is not suitable for pressure canning. They are quite different. Just to make things super confusing - I have read that you can use a pressure canner to cook with but a pressure cooker is not safe for canning with. I assume that the cookers just don't have the suitable gauges or something (I haven't really looked into the why of it). We have solar on our homestead and it is definitely a balance. We spent a lot of time evaluating all of the things we used and how much energy they required. I have a washer and dryer but try to never use the dryer because it is probably the worst energy drain there is. We had this induction cooktop that someone gave to us for Christmas. It was amazing, could boil water in no time at all but the energy it used was outrageous. It would cause a breaker to go every time I used it. That said, I have a blender and stand mixer and other gadgets that I used daily without issue. We used a Kill A Watt Electricity Usage Monitor tool to test everything when we were tightening up our systems and usage (thirty bucks on amazon) you might find that helpful. I agree about the Dutch oven bread. I love crusty loaves so much and this is such an easy way to make bread. I've got a great no knead recipe that is so effortless. The wood stove is a Canadian brand, Pacific Energy 2.5 Newcastle in black painted cast iron. 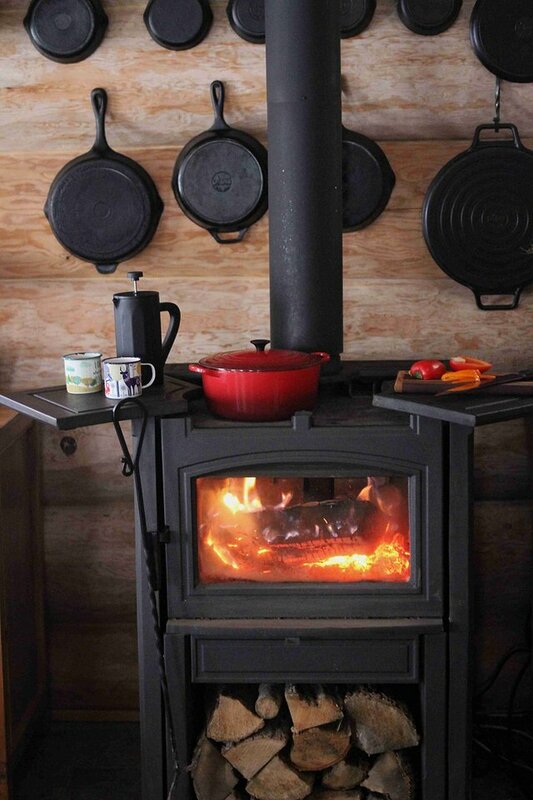 I love that it is cast iron and those warming plates that swing out get a lot of use. I sit my bread on them to proof when the air is cool in the house. (we heat only with wood). The only down side is the cooking surface isn't huge. My larger pans don't all fit on it. Ahh, awesome, so funny you mentioned the kill a watt, we just ordered one over the weekend so we can start monitoring our appliance energy usage while we are still renting to better figure out our energy needs for planning our solar setup. It's good to hear you also spent some time doing the same. We have a lot of ideas while we brainstorm and to hear that others have put those same ideas into action is very reassuring and validating! We are also planning on heating mainly with wood, fortunately in Colorado it doesn't get quite as cold unless we are at elevation. We are looking at property between 7k and 9k ft elevation, chilly but we have some friends who live at 10k who have to fire their stove up even in the summer sometimes. Thanks for the suggestions, it's so helpful! I'll be looking out for a pressure canner as I'll be canning a lot this winter at our rental. It's never too early to learn skills! I am really happy for you @thetreeoflife! I can feel the excitement and that wonderful energy that comes from taking a big leap when I read your posts. I like and own Lodge cast, but was sad to see that their enamel Dutch ovens were from China. I was going to treat myself to one for Christmas. yes, it is such a shame that some of their products aren't made in the USA. Apparently they could not find any company in the US that would provide the enamel service that they needed. I haven't tried one myself so I am not sure how they stand up beside the pots made in France.